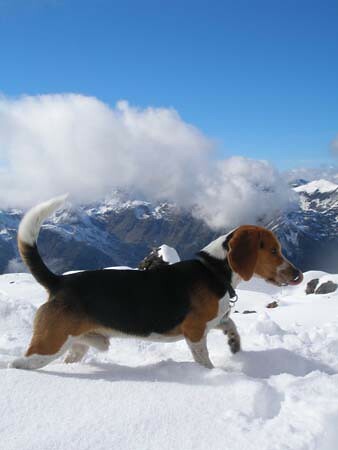 Breed: Pure bred beagle. No mutt in here, thank you very much. 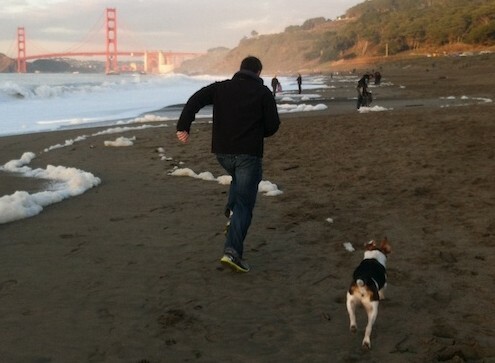 This is me racing my Dad at Baker Beach in San Francisco. Things I love: Chasing seagulls at the beach, sniffing dog butts, peanut butter-flavored treats, peanut butter, naps. Oh, and writing. It’s my new hobby. Just watch, I’ll be Hemingway in no time. Things I hate: Poodles. Don’t even get me started. Ever heard of a comb? Why you should read my blog: It is my belief that dogs aren’t heard nearly enough in literary circles. I’ve made it my mission to change that. Here, I will write about San Francisco daily life, my reactions to national and SF-based news and offer tips for other dog owners on how to awesome-ify (yes, that is a word) their dogs’ lives. Sign up for my RSS feed. You won’t regret it. How to contact me: I do appearances from time to time, but book up fairly quickly. So if you want me to grace the opening of your store with my presence, write a guest post on your site or feature me in any other fashion, you’ll need to run any requests by my publicist. You can reach her at lucyrufftails@gmail.com. Lucy, my name is Max. I’m a male beagle, fully functional! I like long, long, long walks anywhere. And I love playing. Do you ever want to have baby beagles? Thanks so much for writing! I really like your picture. Looks like you are having a great time in the snow. I’m not able to have baby beagles; I’m fixed. What about you? Do you have plans for children someday? Keep in touch and thanks again for writing to me.